Are you checking out overhead cranes for sale? If so, you have many options to consider. In fact, a major decision like this can be overwhelming without the right assistance. CraneWerks is here to remove all the guesswork, and help you find the perfect crane for your facility. Should you install a single girder or double girder system? Maybe an underhung unit is best for your needs. How about an electric powered or manual operated crane? Does your facility have plenty of headspace for a standard overhead crane? These are all important questions to ask. You will also need to consider whether you require a freestanding jib crane,or maybe a wall mounted unit. Gantry cranes are another possibility to think about. 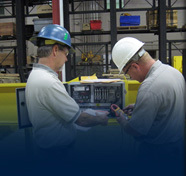 When you come to CraneWerks, you have the benefits of licensed engineers with years of experience. They will analyze your current structures to see what your facility can handle. We have many pre-designed overhead cranes for sale, as well as other crane systems which may be just right for your needs. If those options do not meet your requirements, we can custom design, build, and install the perfect crane system for you. Perhaps you are looking into overhead cranes for sale because your current crane is broken, or worn out. Cranewerks provides repair services, and can completely rebuild your current crane. It will function like new again! Call us today at 1-888-544-2121 for more information.